Racoon Creek in Gallia County is still frozen over in some places. As the temperature rises and the snow and ice melts, chances of flooding-related issues can arise along smaller waterways such as this. OHIO VALLEY — With winter precipitation expected to melt over the weekend, eyes are on the rivers and waterways watching for flooding. Currently, the locks and dams along the Ohio River are keeping levels under what is considered flood stages, although many did crest early Monday Morning. According to Brian Maka with the Huntington District of the U.S. Army Corps of Engineers, they are only experiencing flooding in the Muskingum River area north of Athens. All other points along the river are well within normal stages. According to Maka, the flooding in Muskingum isn’t likely to result flooding in the tri-county area. He explained that the increased flooding in the Muskingum area is a result of the locks and dams along the river dealing with ice jams, reducing water flow in order to break up the ice. The current cold spell is shorter than the previous, which did manage to freeze portions of the Ohio River. 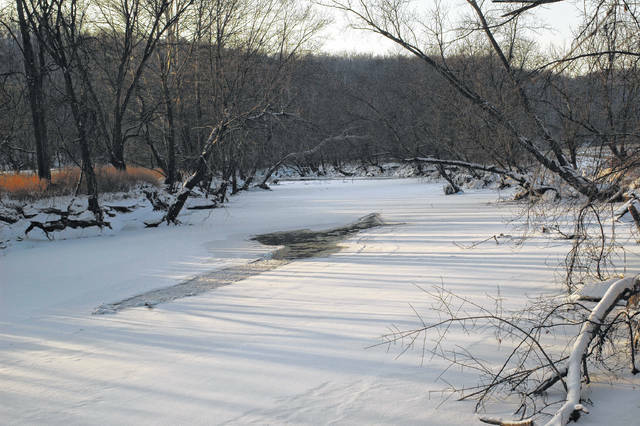 While this cold spell isn’t likely to do the same, smaller creeks and waterways are likely to suffer ice dams and flood, According to Young. As creaks and streams rise with flood water, nearby roads will become dangerous, especially considering more freezing temperatures on the horizon. The previous cold spell was 12 days below freezing; a long enough and cold enough period to create serious freezing on the waterways. According to Young, this mindset let people to expect similar results with this shorter cold front. The NWS in Charleston is predicting highs above freezing for the next several days with overnight temperatures still below freezing.